The barn has been a beehive of activity lately, with horse shows and events, but I caught a nice quiet evening for a ride. Wizard and I rode under the lights outside, and my friend was there grazing her mare. We continued our transition work, warming up at a walk and trot on a stretchy loose rein and then beginning walk-trot transitions at each arena marker. I incorporated a working trot, a forward trot, and a slow trot between the markers. We then did some circles, and eventually began canter work. Wizard is still slow and awkward into a canter, but improving. I did transitions within the gaits at the canter as well, going from a working canter to a hand gallop and down to a slow canter. My mom came out and took some pictures of our ride. I started in the small dressage arena and worked on some lateral work and bending in addition to transitions. We did trot work and then went to the large outdoor arena to do a little JUMPING!!! Two cross-rails were set up three strides (three lonnnng strides of four short). Wizard and I rode down the line about 4 times and he was a STAR. 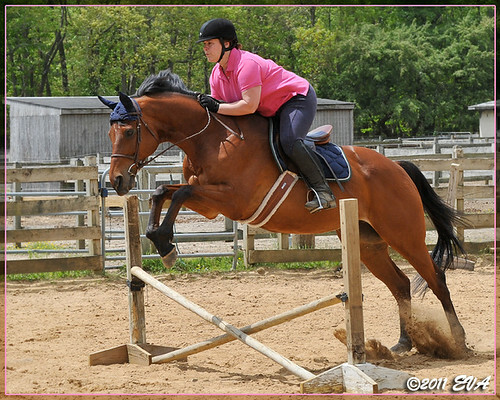 He jumped with his usual heart, clearing the jumps by over a foot. Wizard and I took the two mares, Lily and Philly, out on the trails. We did one of the longer loops and rode it in reverse. We even found a new trail! Wizard navigated the trails wonderfully, and was both the leader and the follower throughout the ride (mostly leader, ha ha). When we returned, I did a little loosening trot work in the dressage arena with him, stretching and lengthening his stride. The air was cool and there were not a lot of flies out. A perfect night for a ride!